Oh my gosh I love snatching stuff on clearance at Target!!!! Especially when it's something I was going there for specifically and there it is....for half the price I was expecting to pay!!!! 1. First is this ADORABLE mini binder!!! I was looking for one to coordinate with a printable calendar set that I'm working on (sneak peek below), and this is perfect. It was regularly $5.99 and I got it for $4.18. They had 8.5x11 ones too that were just as cute, and I may have to go back and get a couple before they're gone!! 2. 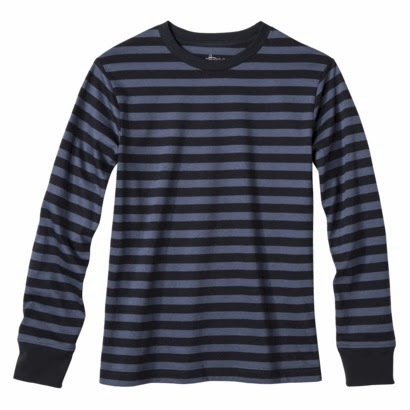 Boys long sleeved striped tops for only $3.50!!! These are still $7.00 on Target.com, so each store must have their own clearance items, and I was so excited to get these for Mason. I got the gray one like below, yellow and orange. 3. 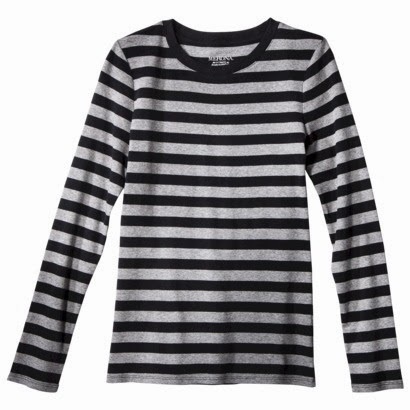 A top for myself, very similar to the boys ones for only $3.60. These are on clearance at Target.com for $10.20, so I got another great deal! I'm not normally to drawn to plain t-shirt style tops, but lately I have discovered that with some cute jewelry or a scarf, a top like this can look great! I wore it yesterday with a vest similar to this one. 4. Lastly were these Post-it filing tabs. I needed these for my calendar binder too. The clearance price was $1.88 and the original price was $3.79!! !